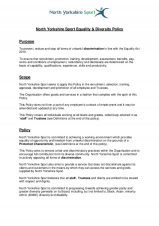 North Yorkshire Sport is fully committed to the principles of equality of opportunity and is responsible for ensuring that no job applicant, employee, volunteer or trustee receives less favourable treatment on the grounds of race, ethnic origin, disability, age, gender, nationality, colour, parental or marital status, pregnancy, religious belief, class or social background, sexual preference or political belief.North Yorkshire Sport will ensure that there is open admission to all those who wish to work in partnership or collaborate with North Yorkshire Sport, across all areas of our work and the sport and physical activity landscape and that they are treated fairly.North Yorkshire Sport are committed to achieving gender parity (with a minimum of 30% female) and greater diversity generally our board, including, but not limited to Black, Asian, minority ethnic (BAME) diversity, sexual preference and disability. North Yorkshire Sport do not pursue diversity for the sake of it or to achieve a 'tick-box' result; we do it because diversity brings new thinking and challenge to old ideas. Not only do we want our trustees and staff to reflect the population they serve we want them to ensure we consider and cater for all aspects of North Yorkshire when we make decisions about where we commit and utilise our resources. 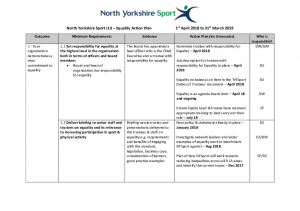 North Yorkshire Sport are committed to having no less than 1/3rd of our board from either gender (we currently have 2 women and 5 men) and we welcome and encourage applications from all members of society without prejudice to age, sexual orientation, disability, gender, religion or race. We will ensure any trustee vacancies receive the widest possible coverage to guarantee that opportunities are seen and available to all. Sportivate: North Yorkshire Sport has targeted funding to support BME projects with delivery of boxing & badminton programmes across 2 mosques in York. Each engaging young people from the BME communities who otherwise would not be accessing sport & physical activity in their local community. Females have also been a key target for North Yorkshire Sport with a 52% of participants across funded Sportivate programmes in North Yorkshire in the previous 6 years being female. Satellite Clubs: North Yorkshire Sport has prioritised funding for providers delivering within the most deprived areas of North Yorkshire and targeting young people who are in most need, often with limiting disabilities or a range of socio-economic issues to deal with. We have encouraged deliverers to target inactive females for Satellite Clubs and we have funded a range of female only clubs.